What in the world do you do with the special art your children created? It piles up quickly, especially during their pre-school and elementary years. I’d like to offer you some options for saving artwork created by your kids or grandkids. First, be extremely selective by saving only the cream of the crop. Ask yourself, are all their early scribbles worth saving? Recycle or toss anything that isn’t. It will be okay, I promise you. You may feel guilty at first but you’ll soon forget about it. In the meantime, your children have moved on to creating new designs. For the pieces you do keep, show off their talents by exhibiting it in one area or throughout the house. Swap out the older art for newer pieces as they bring them home. 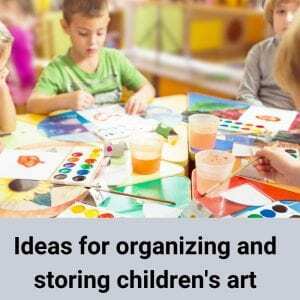 To organize the pieces, not on display, create a keepsake box for each child. Start with a fairly large box that will hold their big pieces as well as the small ones. Consider where you will store the box and space it will require. If it’s under the bed you will need a shallow and wide box. Another storage option is a large portfolio from an art supply store. They are best for oversized, flat pieces. The portfolio can be stored pretty much anywhere: under the bed, or upright, behind a headboard or a bookcase. **If you have more than one child, write the name of the artist on the back of all their pieces along with the year it was created; I guarantee you’ll forget what’s what in a few years. Save space by creating a digital record of their art. Be choosey about what you digitize and then scan the small pieces, or better yet, simply take a photo of each piece or collection. This works well for all art and especially 3-D items or fragile pieces like sculptures. You may even want to snap a photo of your child holding a piece of their art. Digital photo albums can then be created and stored in the cloud for each child and each year. It’s important to find a solution that works best for you. Strive for simple and sustainable. My grown daughter shows very little interest in her saved box of art and yours probably won’t either….unless they become a full-fledged artist as an adult. Click here to find out how you can receive Jill’s motivational messages.